I’m bound for Florence this morning, but not quite yet. My train doesn’t leave until just past noon, so there’s still time left for one last walk around the sestiere of Santa Croce before I have to say goodbye to Walter and the wonderful Hotel al Ponte Mocenigo. There are two “unofficial,” or collateral, exhibits from the Biennale nearby, plus a separate gallery devoted to honeybees and Murano glass. I decide to visit them all. The first involves a crane and an odd red sculpture that’s been suspended from it these past four days. I saw it when I first arrived that day on the water taxi, just to the right of the church at San Stae, and I’ve wondered about its purpose ever since. When I enter the United Cultural Nations exhibit, a beam of light leads me down the hall of a grand palazzo towards a room filled with the sound of tribal drums. Overhead, a hole has been cut in the ceiling and there, suspended high above, the red sculpture is hovering. It’s called the “Flying Ship.” The brochure says it’s meant to “promote rethinking the relations between individuals and others” and the “spirit to reach a new destination.” For me, though, it’s simply an Aha moment. It resolves a mystery. I may not understand what it means, but at last I know what it is. The second exhibit is sponsored by Paraguay and while a number of artists are represented, two in particular stand out. On a small computer monitor, Daniel Milessi offers an imaginative history of his country in video game format. It reminds me of the old Pac-Man consoles I used to play in pizza parlors when I was a girl, though in place of the game’s original ghosts, the enemies are invaders and the outcome is told in pixels of blood. My favorite of the day, though, is Pedro Barrail. 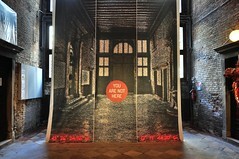 There is a wall in the palazzo that’s been covered with its own image, printed with a large red dot in the center and the words: YOU ARE NOT HERE, alongside the longitude and latitude measurements of the room itself. It’s clever, really, and while I may not grab the “red lifesaver and head for redemption,” as the brochure advises, I find myself staring at it in defiance. It reminds me of the hurdles I have crossed over the past two years, to say nothing of the past two months. I AM (most decidedly) HERE. I grab my luggage at the hotel, promise Walter I’ll be back again next time, and then sprint off to the train station. It’s just a short journey to Florence, less than two hours, but the change in scenery is striking. Here, too, I am greeted by a series of familiar associations that bring a smile to my face as they pass outside the window of the cab—the green and white façade of Santa Maria Novella, the tower of the Palazzo Vecchio, and Brunelleschi‘s enormous red dome on the Duomo, which peeks out from behind nearly every street in town. As in Venice, I’m returning to the same hotel that I booked on two previous trips to Italy. I’m a creature of habit and revisiting places gives me a sense of comfort and identity, a neighborhood to call my own. When I’m in London, I live—temporarily, at least—in South Kensington. In Paris, the 5th Arrondissement is my home. 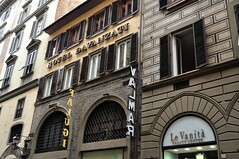 And when I’m in Florence, I stay at the Hotel Davanzati. It’s as simple as that. It’s mid-afternoon when I climb the stairs and emerge out of the elevator into the quiet lobby. Tommaso greets me warmly from behind the reception desk and I inquire about his family, and his father Fabrizio in particular, as he encodes the key card. Before long, we’ve caught up and we’re talking about businesses and unions and Italian politics, and debating whether or not the U.S. is any less dysfunctional. It feels good to be back. Outside, the day has turned gray and cool, and I spend the remainder of it reacquainting myself with the city. 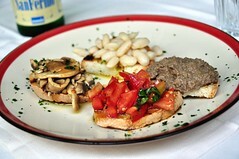 I stroll down to the Ponte Vecchio and across to the Oltrarno for some window shopping, before retracing my steps back to Via Porta Rossa for an early dinner at La Grotta Guelfa—some mixed crostini and a bowl of risotto with mushrooms. 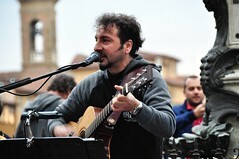 Afterwards, I walk back to the Ponte Vecchio in the hope of finding a street musician named Claudio Spadi there. I’ve heard him play every time I’ve been to Florence, and there he is again, singing a cover of Coldplay’s “The Scientist” to an appreciative crowd and the setting sun. As in Venice, some things never change, and for that I am grateful.